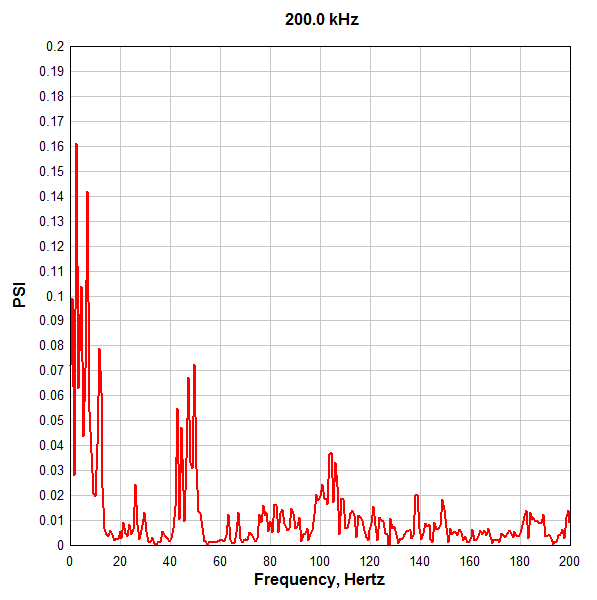 DPlot is a Windows program that lets digital recorder users create presentation-quality graphs from a wide range of digital recorder manufacturers. Whether you're using Pacific Instruments recorders, Nicolet time domain files, Tektronix WFM files, Gould Instrument Systems .DAT files, Hi-Techniques Win600 .DAT files, LeCroy WavePro data files, AMO Saturn Transient Recorder data files, LAS Well Log Files, Datataker .DBD files, or Campbell Scientific Datalogger files, you will benefit from DPlot's powerful graphing capabilities. No other commercial graph software includes support for this collection of formats. DPlot offers graphing capabilities that are impossible to find in the software that comes bundled with digital recorders. DPlot's presentation-quality graphics consistently outshine competitive software. But the key to DPlot's success with digital recorders is the native, built-in functionality that simply isn't available in other applications. 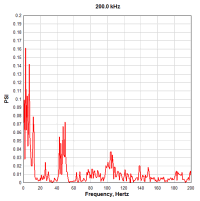 DPlot gives digital recorder users the highest quality, most accurate graphs that are available on the Windows PC today. And by using captivating graphics in your digital analysis, you make your data more accurate and more useful. Because DPlot supports all of the popular digital recorder hardware systems, you're not locked into a particular manufacturer's gear. You're free to switch hardware suppliers without learning another graphing software application. With DPlot, scientists can utilize data files from a wide variety of sources, and turn them into graphs of all types. DPlot easily lays out the graphs the way digital recorder users need them, and labels and annotates them. For added emphasis, it's easy to use photos or images as the background for your graphs. In addition to using DPlot for your digital recorder data, you can also use it for general business graphing. DPlot lets business people graph and manipulate 1-, 2-, 3-, and 4-dimensional data. If you have a spreadsheet file or an ordinary comma-delimited file that contains statistics by year, or any groupings of figures, DPlot can grab the data, and lay it out for you in a huge variety of graphic representations. DPlot's Excel add-in makes it simple for digital recorder users to move data in a variety of layouts from Microsoft Excel to DPlot. DPlot lets you display presentation-quality graphs in a number of graph types that are simply not available in Excel, including polar charts, triangle plots, Mercator projections, and grain size distributions. These graphs support the work of professionals throughout the enterprise. Some of your colleagues and stakeholders learn well from your verbal presentations. Others can grasp scientific and technical data more quickly if they see it displayed graphically. DPlot makes it easy to turn data into graphics, effortlessly. Sometimes people need to create stunning contour plots of 3- and 4-dimensional data. Other times, a bare-bones chart can tell your story much more effectively than words. DPlot can meet all of your graphing needs. A single-user DPlot license costs $195(US), and will improve all of your digital recorder graphs and charts now, and for years to come. 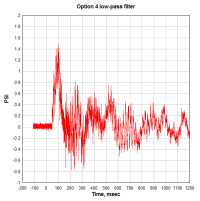 DPlot provides a data processing mode, the primary feature of which is the automatic integration of pressure and acceleration records to obtain impulse or velocity and displacement, respectively. Integrated records are automatically regenerated when you make changes to the primary record. 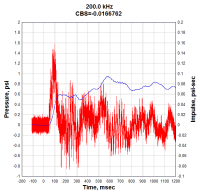 Often with high-speed recordings, small calibration errors can lead to a small offset in the data. That offset may not be noticeable in the primary record, but show up as a positive or negative slope in an integrated record. Though that slope is propagated through the entire record, it is most obvious at a time when the integrated value should be close to zero. 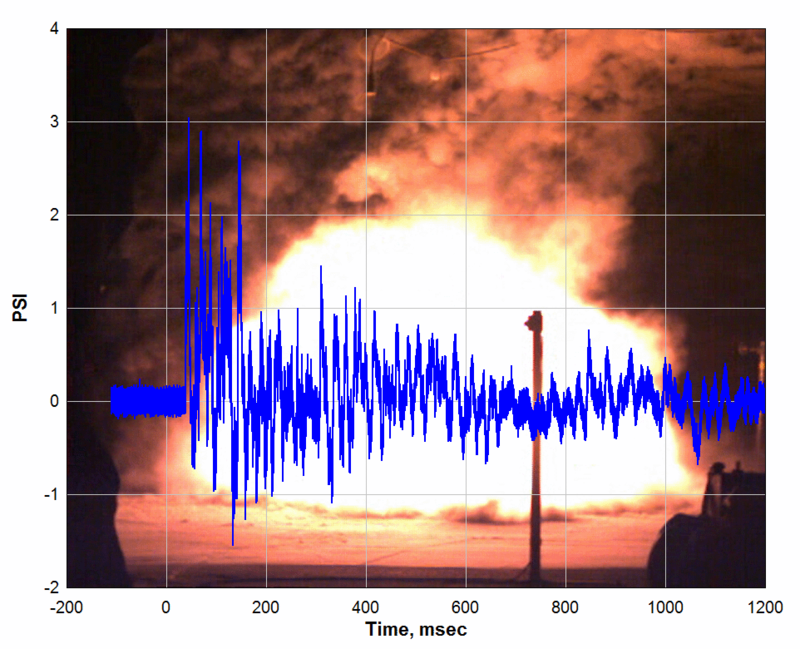 In the example above, the integrated record shows a positive impulse at the arrival time of the shock. You can easily correct this by using DPlot's Baseline Shift command. 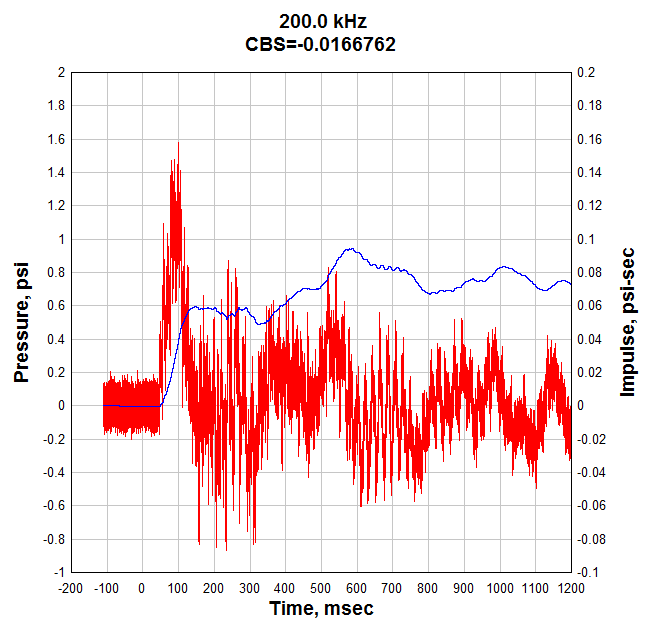 The baseline shift adds or subtracts a constant value from the primary record to yield the desired value in the integrated record (in this case, impulse=0 at the arrival time). 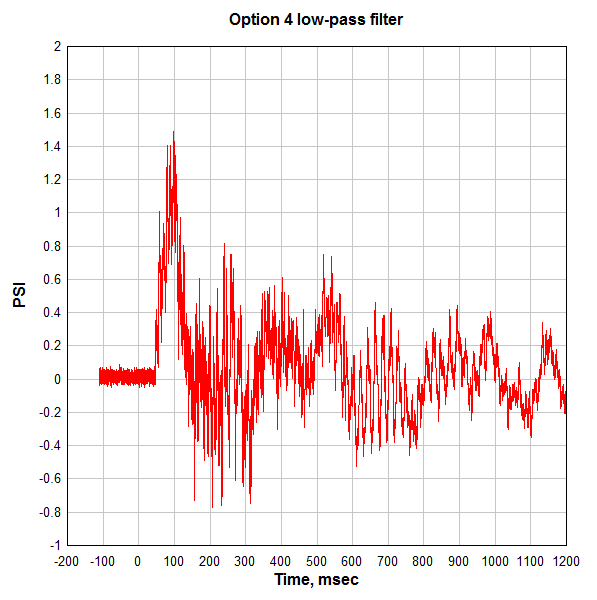 DPlot's filter routine also includes bandpass and bandstop filters, for accepting or rejecting a range of frequencies, respectively. 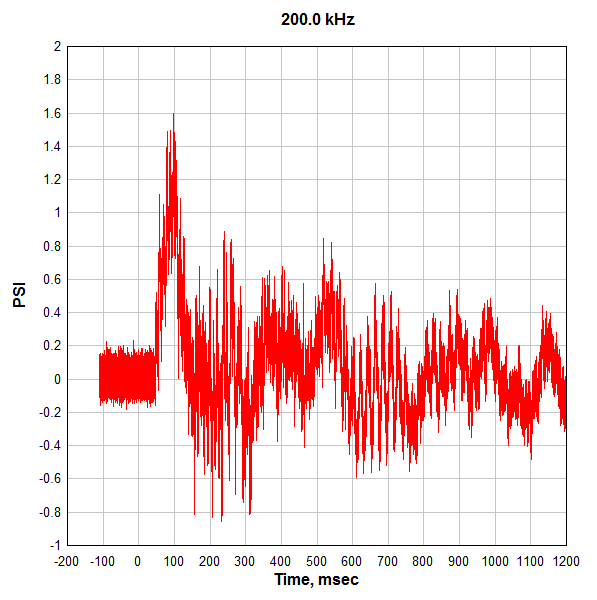 DPlot's many data-generation features include an FFT, useful for finding the predominant frequencies in a signal. This is especially useful for determining whether a signal has been corrupted by, for example, 60Hz noise. In that case you can generally eliminate that noise with one of the bandstop filters mentioned above. DPlot has made - and continues to make - my life easier as a research scientist. DPlot is a fantastic product with great customer support on the website. DPlot is integrated with Microsoft Excel and includes dozens of features combined with crisp graphics, leaving it unparalleled among programs for scientific data plotting. DPlot fills a niche for easy, rapid, and crisp plotting of data in ways which are not possible with programs like Origin and Sigmaplot. I bought DPlot during my PhD because no other program had the correct combination of being simple to use while containing diverse features and producing crisp graphics. And I continue to use DPlot even after my PhD, because it does all of these things better than its competitors, and blows away the competition in its licensing prices. 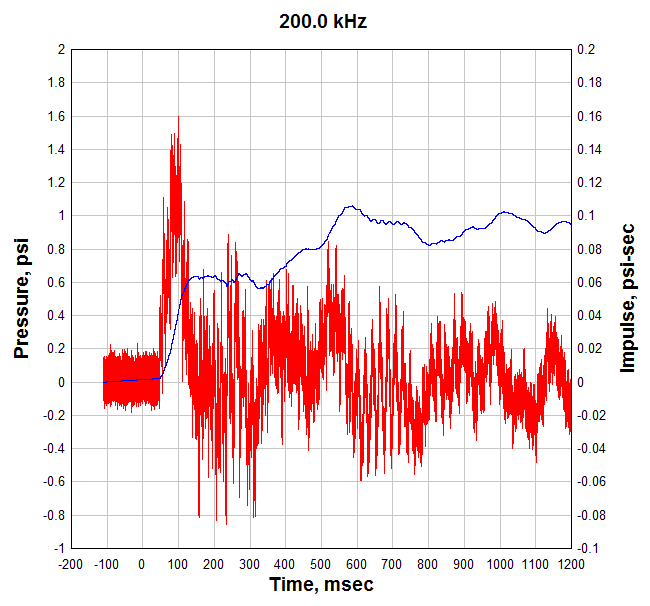 I have used DPlot to produce graphics for several scientific publications (J. Phys. Chem. C, 2008, 113, 2806-2815; Phys. Chem. Chem. 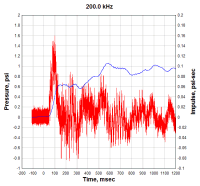 Phys, 2009, 11, 1180-1188; Appl. Catal. B, 2009, 90, 120-125; J. Phys. Chem., 2010, 114, 20621-20628) and I am continuting to use DPlot for more publications. If my career leads to a faculty position, I will obtain site licenses for the use of my students because I endorse it so strongly. Overall, I highly recommend DPlot for academic research scientists, and I envision it becoming a standard in the future. If you're not convinced, look at the examples at dplot.com, download the trial version, and thank me later.